Recently WMF kitchenware has launch a range of ceramic cookware which available in colours inspired by minerals and has a subtle metallic effect. This FUSIONTEC range comes in four different colours and personally I preferred their exquisite shade of either dark brass and rose quartz. Furthermore these WMF FUSIONTEC pots and pans are scratch and rust resistant which makes it idea for home cook like me who cooks at least 5 meals a week. With its high-retaining properties it helps to save energy, time as well as less nutrients lost during cooking process. Besides food also stays hot for a longer period of time like 30 minutes after boiling time. You can checkout the recipes below on how I use these pots to prepare soup, rice and noodle then serve it straight from stove to the dining table. This Lunar New Year let's kick off with a quick Braised Ee Fu Noodle that resemble promise of longevity! As I am pairing the noodle with Fish Maw Soup I add a couple of dry scallops in the soup to enhance the taste plus I can use it to braise the noodle. Watch how we prepared this Ee Fu Noodle & Soup. 1. Half fill the 20cm Low Casserole with water then blanch Ee Fu noodle for 30 seconds to soften as well as remove the fried oil taste. Rinse and drain noodle then set aside. 2. In the same casserole pot add 1/2 tablespoon of oil and saute ginger, white part of scallion, shredded scallop (cooked and removed from the fish maw soup) and mushroom for a minute or until mushroom turns soft. 3. Next add in stock and simmer on low heat for 5 minutes before adding in oyster sauce and noodle. 4. Toss in scallion, mix well and simmer on low heat for 3 minutes. Remove and serve with fish maw soup. Fish Maw Soup is actually pretty easy to prepare at home and you can enjoy it anytime of the year. To start with you need some good quality of fish maw (threadfin or eel) which you can get from prevision shop in the wet market, Chinese medical hall or supermarkets. 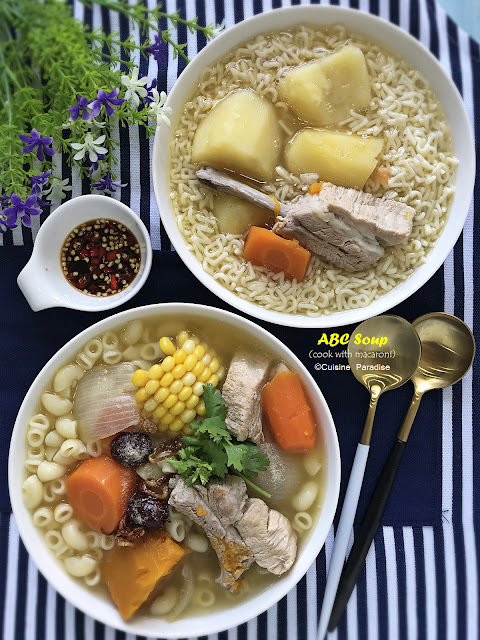 Besides fish maw you can add in extra ingredients that you preferred such as fresh crab meat, scallop, shrimp and etc and cook in superior stock then thicken the mixture with potato starch solution before serving. 1. Break fish maw into large pieces shown above then soak in hot water till soften. Rinse then with sea cucumber sliced them into 1-cm width strips. 2. Remove the vein of the shrimps, cut each into 4 sections them lightly marinate them with some cooking wine and ground pepper. 3. In a saucepan add about 1-litre of chicken stock together with 2 slice of ginger and dry scallop. 4. When the mixture comes to boil add in fish maw, sea cucumber and mushroom then continue to simmer on low heat for about 25 minutes or until fish maw soften (at the stage remove the scallop and reserve 150ml of stock for braising noodle). 5. Next stir in shrimp follow by potato starch solution (1 tablespoon potato starch + 1.5 tablespoons water) to thicken the soup. 6. Lastly swirl in beaten egg white and serve with coriander, ground pepper and black vinegar. I grown up in a Teochew dialect group family where we always has this Salted Vegetable Duck Soup available on new year menu. I still remember vividly when I was young my dad used to cook this soup over charcoal fire and while waiting the aromatic really makes you drool. Watch how we prepared this quick and easy Soup & Rice. 1. Soak salted vegetable in water for about 15 minutes, rinse and roughly cut it into chunks. 2. Remove the skin and trim the fats off from the duck then cut it into 6-8 pieces. 3. Half fill the 20cm High Casserole pot with water then bring to boil. Blanch spareribs and duck for a minute to remove the impurity then rinse and set aside. 4. Using the same pot saute ginger, garlic and blanched meat for a minute then drizzle some cooking wine and cook for 30 seconds. 5. Next add in crashed peppercorn, salted vegetables, water, chili and sour plum. Cover and simmer for 30 minutes. 6. Lastly add tomato and continue to cook for another 15 minutes or until both meat are tender to bite. Cabbage Yam Rice is one of my favourite childhood dish which my dad used to cook. Sometime to make it a quick one-pot meal he would add in either chicken or pork belly to make it more filling. 1. In the 16cm saucepan saute taro cubes with 1 tablespoon of oil till golden brown on sides then push to aside and add in minced garlic and dry shrimp (lightly pound). 2. Saute the mixture for 30 seconds till aromatic, add in cabbage and cook for a minute then season with oyster sauce. Remove and set aside on plate. 3. Using the same saucepan add in drained rice and give it a few stir to coat the remaining sauce in the pot before adding water. Stir through then cover and simmer on the lowest heat till water almost dry up. 4. Lastly add back the cabbage mixture over the rice, cover and continue to simmer for another 5 minutes till rice is cooked and fluff. 5. To serve you can drizzle some dark soy sauce and fried shallot oil then mix through the rice and divide into serving plates. - Maximum 320g (2 rice cooker cups) long/short grains can be cooked in this 16cm WMF saucepan. Vinegar Pig Trotter is one of the classic confinement dish that helps to boost post natal immunity. But for certain Chinese dialect group this is also one of their signature dish to be served during Chinese New Year. Watch how we prepared this Vinegar Trotter & Rice. 1. Place clean eggs in the saucepan filled with water cover over the egg then simmer on low heat for about 10 minutes. Remove and rinse eggs then soak in tap water for 5 minutes before peeling the shell off. 2. Bring another of water to boil then blanch pork trotter for a minute or two to remove impurity. Next remove. rinse and drain well. 3. Using the same 20cm High Casserole saute a few slices of ginger with 1 tablespoon sesame till aromatic, add in blanch trotter and sear it for 2 minutes before remove and set aside. 4. Next add in remaining ginger (skin remove and cut into chunks) with another tablespoon of sesame oil, black bean and rock sugar. 5. Saute on low heat till aromatic then pour in the black vinegar, water and pig trotter. 6. Cover and simmer for about 30 minutes before adding in hard-boiled egg and continue to cook for another 15 minutes or until meat is tender. Made a pot of Assorted Mushroom Rice to go with the black vinegar trotter. You can use any type of mushrooms that you prefer, here I mix fresh shiitake mushroom with shimeiji. 1. In the 16cm saucepan add in soak and drain rice follow by water (can be replaced by same amount of chicken stock). 2. Next stir in seasoning sauce then arrange the assorted mushrooms over the rice, cover and simmer on the lowest heat (takes roughly about 7-10 minutes). 3. When the water drys up scatter the sliced carrot on top, cover and stands for 5 minutes before serving. Tip: Maximum 320g (2 rice cooker cups) long/short grains can be cooked in this 16cm WMF saucepan. 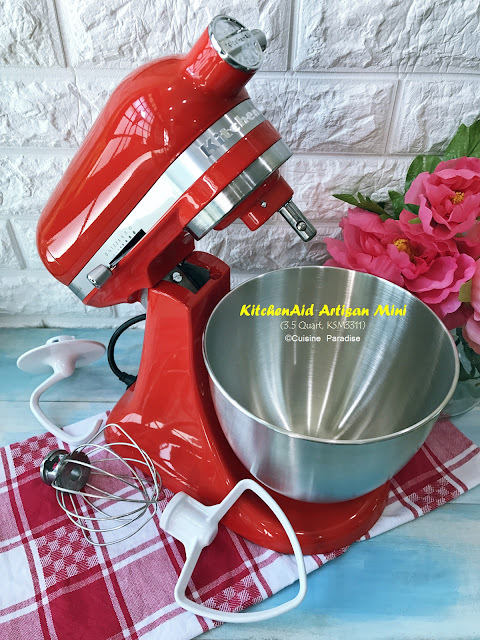 *Disclosure: I was given a set of the new set of WMF FUSIONTEC 4-piece Cookware from WMF Singapore for this review purpose but all opinions expressed in this post are of my own and there is no monetary compensation received. All images, videos and recipes are copyright to ©Cuisine Paradise.